eBook reading could play a significant role in improving the reading experience and academic advancement of children in disadvantaged schools. Accordingly, the eLibrary Project is examining the feasibility of distributing Kindle eBook Readers to school libraries around the country. Our initial pilot project will evaluate the impact that the devices have on a class of Grade 11 students at St Francis College, an underprivileged and non-denominational school in Johannesburg. 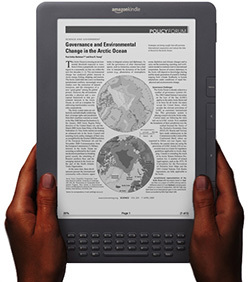 The advantage of the Kindle is that it provides learners with access to a large volume of information. The Kindle can store up to 1400 books, has a battery life of a month, and only costs R1200 ($150; £100) including taxes and shipping. Many books prescribed at school level are copyright-free and Kindles may be a cost effective way of providing students with access to great literature from around the world. With the assistance of Kuper Research we will compile both quantitative and qualitative research during the pilot. The Kindle has the potential to revolutionize the way students learn. Once the pilot is complete we will submit our research outcomes to policy makers and NGOs. We hope that our pilot will assist these stakeholders in determining whether eBook Readers should be implemented more widely. The eLibrary Project is currently seeking donations. Please visit our donors page for more information about how you can help to promote literacy through technology.